Robomodo’s Tony Hawk’s Pro Skater 5 finally released this week, and a lot of people didn’t even know the game existed until it arrived on store shelves. This isn’t a great sign, especially when combined with the fact that Activision apparently didn’t send any advance copies to reviewers. Almost everyone in the video game community saw all this as a surefire sign that the game would be a dud, but some of us had hope. The only piece of promotional material I actually saw in advance of the game’s release was Tony Hawk and Lil’ Wayne’s appearance on Conan’s Clueless Gamer segment. The segment was amusing, but it didn’t exactly make the gameplay shine. I still held out hope, and headed to Redbox yesterday to try out THPS5 for myself. I played the game for just over an hour and the expectation that it would be terrible was 100% accurate. The gameplay is very poorly executed, and the game looks and functions like a game for the PS2. The game dumps you into a freeplay mode where you’ll skate around with other skaters, but there’s no way to interact with them besides bumping into them. There’s literally no point to showing other players in the world, other than to say “hey look, people are actually playing this crap!” If you want to engage in any multiplayer you have to bring up a menu and load into a separate waiting area before entering a match. I tried to get into multiplayer matches, however I could only ever find one other player and the matches would always fail to start. Completing missions is no better. Once accepting a mission you’re met with a loading screen before loading into the same environment, minus all of the other players in order to accomplish the mission. Once complete you again have to load back into the free skate area. All of this is slow, clunky and poorly executed. As you complete objectives and missions you earn skill points, but should you want to spend them you have to load back out to the main menu to do so. This is unintuitive and annoying. What’s worse is that should you choose to play as a different skater, Lil’ Wayne for example, you lose your progress and have to re-accomplish objectives on that character. The objectives and missions aren’t even fun to do the first time, why anyone would want to do them on every character is beyond me. There’s so much about Tony Hawk’s Pro Skater 5 that I haven’t seen, but in the hour I’ve played I’ve seen enough to know that it’s not worth a second more of my time. There’s no charm in the world, there’s no local multiplayer and the game has no soul. The only positive is the halfway decent soundtrack, but not even that could save this game. 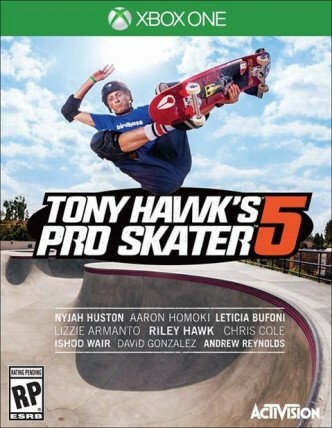 I don’t generally assign scores to games, but I couldn’t see how THPS5 would ever deserve anything more than a 1 out of 5. Avoid this mess at all costs. This entry was posted in Video Games and tagged review, THPS5, THPS5 review, Tony Hawk's Pro Skater 5. Bookmark the permalink. I wasn’t expecting much but I still kinda wanted it to be good haha, oh well, I’ll just remember the good ol days.